I’m always up for some easy summertime (or anytime) recipes. 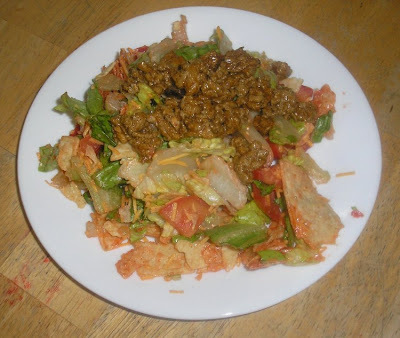 Works for Me Wednesday at We Are That Family recently did a “Summer Recipe Edition.” Econobusters posted this recipe for One Bowl Taco Salad. It looked like an easy lunch idea, motivating me to try it, like, NOW. The picture I took is not that great, but the recipe turned out well and it was very tasty. Not to mention, more economical than picking one up at the drive-thru. Since I have “issues” with recipes, finding it hard to follow them, I basically poured a bag of salad into a bowl, cut it up some more with scissors, turning the bowl over and over to get smaller pieces. I threw some cheese on top of that, cut up two small tomatoes, threw them on top. Took a thick slice of onion, diced it up; added it. Crushed about 7 handfuls of taco chips; sprinkled them on top. Squirted an eyeballed amount of Catalina and tossed away. I loaded up a plate for each of the boys (the 3 younger ones) and myself, added about 1/4 cup of leftover ground turkey taco filling leftover from last nights’ meal, and voila. Lunch. We added a dollop of sour cream to our salads. The kids thought it was a pretty yummy, fancy lunch. I thought it was easy, tasty and just as good as take-out. 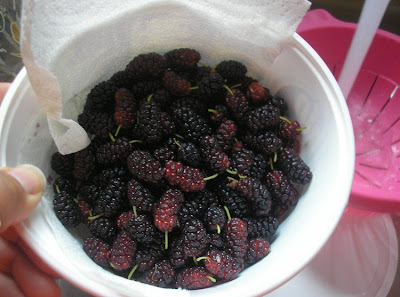 We have a mulberry tree in our backyard. 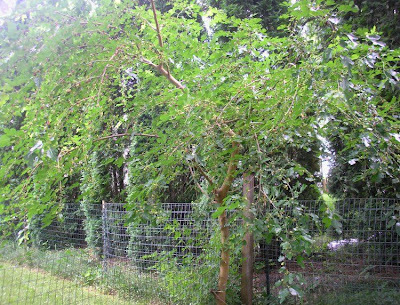 It has been growing now for a few years and bears a decent amount of fruit. The kids love to run out back and pick the berries at random times. 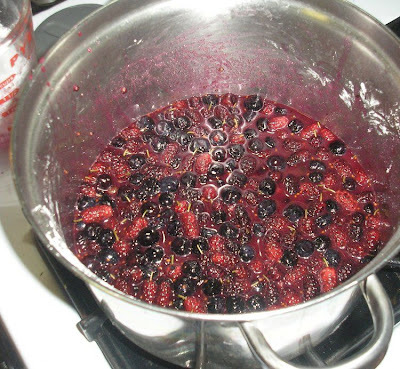 The other day Franny was outside long after the others had tired of picking berries, and came in suggesting that I come out and pick berries to make a pie. 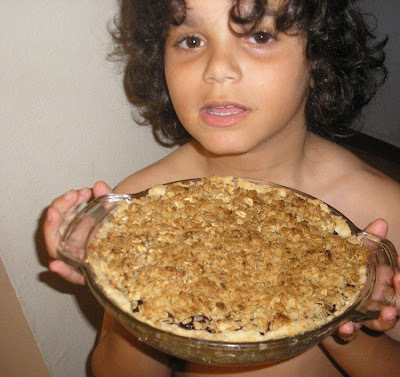 There was no bone in my body that felt like whipping up a pie on a warm summer day. But he was so enthusiastic and sweet, it felt completely wrong to give into my own lazy desire to play sloth. I examined the tree, as he washed out a container for our pickings. He was the holder, I was the picker. Slightly taller than Lootie, who had the farthest reach of the three boys that were picking earlier, I was able to get to spots that still had some nice, ripe berries on them. 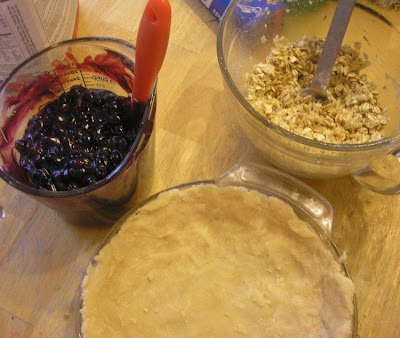 Not enough for a whole pie, but I had a bag of frozen blueberries in the freezer to supplement, and was pleased to have the opportunity to put them to use in a pie. 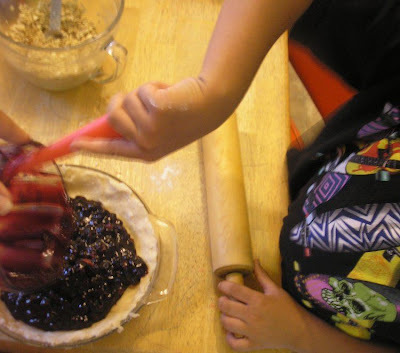 Frozen blueberries are a common staple at our house, but I’ve yet to have actually made a pie with them. 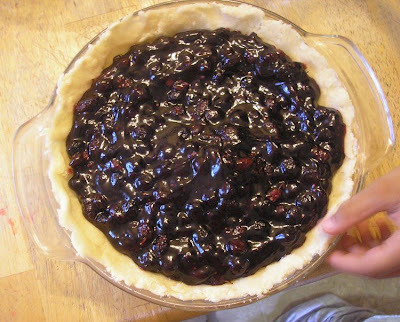 I used this recipe from Crisco for a Bluebbery Pie as a base for the pie we were making. I say “base” because of my inability to stick directly to the recipe when baking. I did my best to stick close to this one, though. I had about 2 cups mulberries and the rest blueberry. Franny was in charge of stirring, but he got sidetracked by the guinea pigs. I picked up the scent of bubbly, boiling fruit on the verge of burning, and ran to the rescue. It had started to scorch on the bottom, but thankfully not enough to taint the flavor of the filling. I used the double crust recipe, but it didn’t seem make enough for the bottom and the top. So I enlisted in my standard oatmeal topping (oats, sugar, molasses, butter, cinnamon, salt and a dash of vanilla). 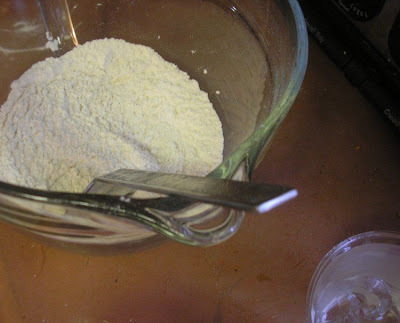 Initially I started to roll the dough for the crust, but that didn’t last long and soon I was using my preferred method — my fingers to press the dough into the dish. Franny helps with the filling. Franny holds up our creation. 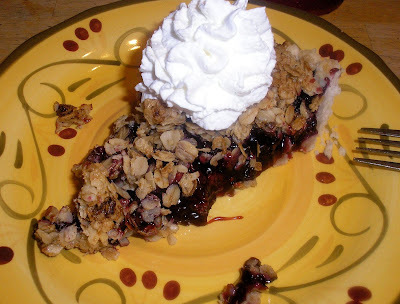 It was fantastic, and I’m not a big fan of fruit-filled pies. 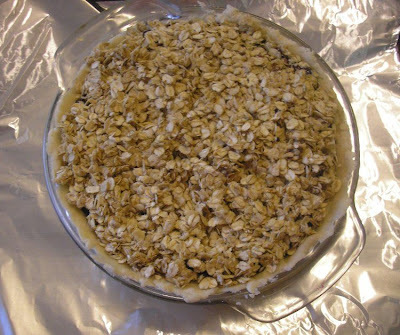 Thank you Franny for suggesting we make pie. I’m so glad we did. I’ve got five kids and they’ve all got temperamental hair. One’s got a ‘fro, one’s got straight thick hair, another curly lion’s mane… so I’m always needing to wet their hair down before I comb it. When my daughter was young (she’s got the nappiest hair of them all), I would stock spray detangler like it was a main food source for our family. Needless to say, that gets expensive. So I started mixing my own detaingler for my kid’s hair. Got a squirt bottle and did a 5:1 (5 part water, 1 part conditioner). Works fabulous and is cheaper than buying detangler by the case. I’ve used all kinds of conditioners, but through trial and error, I figured out that the L’Oreal Kid’s Conditioner (or Suave Kid’s Conditioner — basically a kid-specific conditioner) works best, and it smells good. Now watch them come out with a “concentrated detangling solution” that you mix with water. Don’t act like you didn’t see it here first!! And they best be sending me a case of conditioner, since I’m talking them up like that. And they best not discontinue this conditioner or I’m going to be shaving my kid’s heads.